On the way to the Tuck and Robin Lakes backpacking trailhead, you'll pass through the small city of Roslyn. This city is listed on the National Register of Historic Places and has been designated as a National Historic District. The Tuck and Robin Lakes area is home to numerous mountain goats, which are known to get quite close to humans and their campsites. They are also known to fancy human urine as a source of salt. Because of its beauty, the Tuck and Robin Lakes landscape is often compared to that of Washington State's larger Enchantment Lakes region, which is also commonly referred to as The Enchantments and various other similar names. 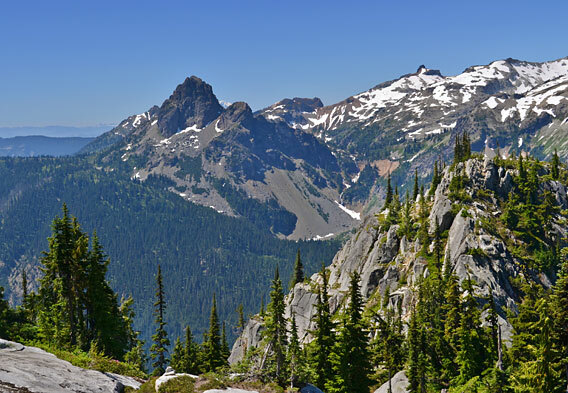 The Tuck and Robin Lakes trails offer some of the best hiking in Washington State. 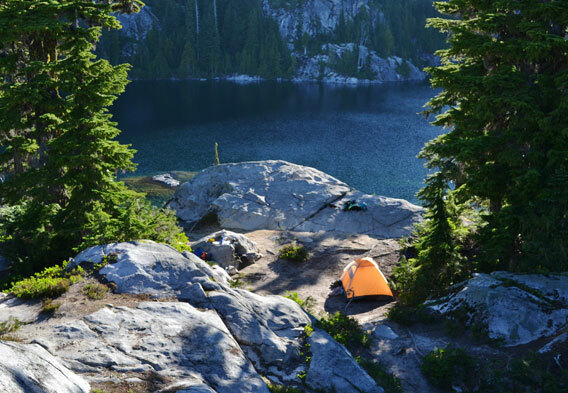 The scenery alone is reason enough to visit this area of the Alpine Lakes Wilderness region. Beautiful lake and mountain views abound. Since the nearly 16-mile out and back trail to the Tuck and Robin Lakes is rated as difficult, however, hikers and backpackers should prepare themselves for a challenge. After the Hyas Lakes in particular, the trails begin to climb and become more and more difficult. Many visitors to the Tuck and Robin Lakes area take the opportunity to camp at least one night to break it all up and to fully enjoy their time out in nature. Whether you just do some day hiking or stay overnight, prepare yourself to see mountain goats as you go, and don't forget to bring bug spray. The bugs are especially bothersome during the summer months. To get to the Tuck and Robin Lake trailhead, you take Interstate 90 to Exit 80, which is the Roslyn/Salmon La Sac exit. This exit is found approximately 65 miles southeast of Seattle as the crow flies. The next move is to take a left off the exit and then head north for nearly three miles to T-junction. At T-junction, turn left onto Highway 903 North and follow this route through Roslyn and Ronald and along Cle Elum Lake. The distance from T-junction to the pavement's end is about 16 miles. Where the pavement ends, the road forks. Take the right fork route, which is Forest Road 4330. Continue another 12 miles or so to the trailhead at the road's end. Forest Road 4330 is a rather rough and rugged road and crosses two streams. 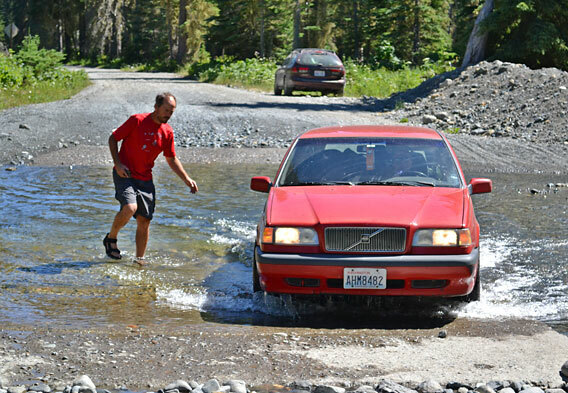 These streams can run high, especially earlier in the season, and be a real hassle for vehicles with low clearance. A good Tuck and Robin Lake trailmap is recommended if you're unsure about directions and what route to take. Staying on track can get confusing at various points along the trails, especially from Tuck Lake up to the Robin Lakes. Once you pass the lower Hyas Lakes, keep an eye out for the rock cairns and follow them when possible. The Tuck and Robin Lakes trails are primarily used for both hiking and backpacking. Backpackers who wish to stay overnight in the area can choose from several established campsites that are found along the trails and at the Hyas Lakes, Tuck Lake, and the Robin Lakes. Thanks to the scenic allure of the lakes, it can be a great idea to secure camping spots with views of the water, though it is generally recommended that you don't camp right on a lake shore. Campfires are actually prohibited along the shores of the lakes and within a quarter mile of Tuck Lake in particular. Campfires are also prohibited at elevations of 5,000 feet or more. As a side note, before you arrive at the Tuck and Robin Lakes trailhead, you will find many forest campgrounds along the Cle Elum Lake road. The best time to visit the Tuck and Robin Lakes area is arguably from August to October. This recommendation has something to do with Washington's "rainy season." While it can rain any month of the year, the state gets the majority of its rainfall between October and early July. The chance of snow and cold temperatures increases as winter overtakes autumn, so winter visits to the area can be especially trying. Just remember that it can get pretty cold in the Washington mountains regardless of the time of year. Be sure to bring warm clothing even in the summer. Bring bug repellant as well. This area is known for its biting flies and mosquitoes, which tend to be more prevalent during the summer months. Later in the season when temperatures are on the decline, the insect population drops dramatically. As noted, the road to the Tuck and Robin Lakes hiking area passes through Rosyln. Thus, this small city is a popular place for hikers and backpackers to visit. Some drop into town for something to eat or to stock up on supplies. The gateway to the Alpine Lakes Wilderness area, as Rosyln is known, is also a popular place to stay before or after a Tuck and Robin Lakes hike. It is worth noting that Roslyn is listed on the National Register of Historic Places and is designated as a National Historic District. Much of the city's original architectural style still exists. Roslyn lodging mainly consists of inns and bed and breakfasts. Examples include the Huckleberry House (pictured above), Harry's Inn, the Hummingbird Inn, and the three different inns that make up the Roslyn Inns family of hotels. Anyone who is searching for area accommodations can also consider the other regional hotels that are found along Interstate 90. There are several hotels in Cle Elum, for example. Cle Elum, it should be noted, is where you will also find the Cle Elum Ranger District office, which can provide information on such things as the area lodging choices and the Tuck and Robin Lakes trails and camping regulations. The address for the Cle Elum Ranger District office is 803 W. 2nd Street.